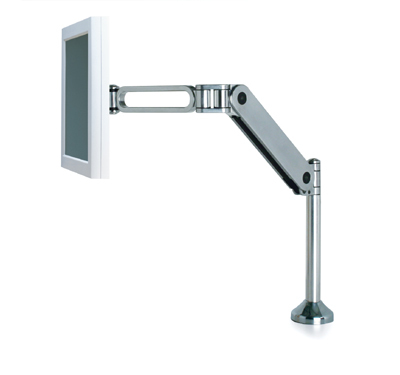 An articulating monitor arm supports the computer monitor on a mobile platform which can be moved up, down, in, and out. 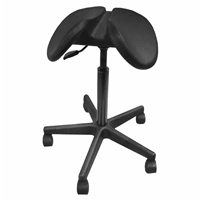 The platform is mounted to an articulating, multi-segment adjustment arm. Some units limit low adjustment close to the work surface, in the range between 25mm - 10 cm (1" - 4") above the work surface. 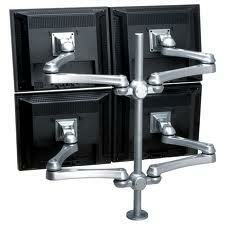 This positions the monitor too high for many users, especially workers with shorter torsos and those under 5'5". Positions larger monitors (>15") too high for most users. A monitor lift is similar to a monitor arm, but is mounted on the desktop and provides simple height adjustment with a spring-loaded platform. May limit low adjustment close to the work surface. This may position larger monitors (>15") too high for most seated users. 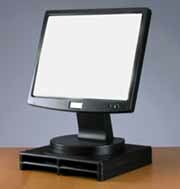 A monitor riser is a shim used to position a monitor above the work surface. Commercial monitor risers usually consist of a box type platform and are available in fixed and mobile configurations, and in stand-alone and stackable models. A ream of paper also may serve as a suitable monitor riser. For monitor positioning close to the work surface, for example, in the range between 25 mm - 76 mm (1"-3"). Maintenance adjustable. Monitor must be removed from platform to change/add/remove riser.